Finally Sega entered the console market with a really good console. I really loved the Game Gear which was a lot better than the Game Boy in every way except bigger. It was smaller than the Lynx but had about the same power. Slightly higher resolution1 and better picture quality. Sadly Sega gave up on the Game Gear while Nintendo pushed on. Nintendo released lots of peripherals such as a magnifying glass with light which did not get close to Games Gears larger, lit up color screen, only making the Game Boy cumbersome. 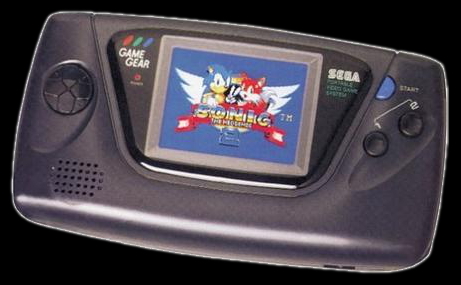 Sega would have gained ground after a while by building up their software library and releasing a smaller version of the game gear as technology had developed. I did not get as much joy with the game gear as I could have hoped for as I lent it to a girl who in her place lent it to a guy who intensionally crushed it when he got angry. I waited for reimbursement to get a new one but I never got it. If that would not have happened I would have bought a lot more games to this wonderful little piece of hardware. 1. Lynx: 160x102, Game Gear: 160x144.